How is the accountability level in your shop? You know, the daily level of “Get ‘Er Done”! I’m not singling out production either. They often get the short end of the stick when other departments upstream don’t hit all of their goals like they should. Does that sound like your shop? Maybe it’s “most of the time”? Or, “usually”? Hopefully not a long, “Uhhhh”. But why not accountable all of the time? With everyone? For starters, how are you defining what success should look like? What is reinforcing that Friday is the target? Better yet, is that job complete on Thursday so all you have to do is ship on Friday? What do you think you need to pull that off? Success starts with painting a vivid picture so everyone understands and can execute their role. What helps is the definition of who owns the core tasks. Let’s start with a typical order for a shop. ABC Plumbing has ordered a two color front print on 144 29M Jerzees Safety Green 50/50 t-shirts. It’s due to ship in seven business days from today. So in your shop, if this was entered into your system do you immediately know these things from the order entry perspective? Think about automatic triggers for each of these and who in your shop is responsible. What day should customer service or sales follow up with the client on the job satisfaction after they have received the finished order? When should your customer pay you for the order without being late? What day should the invoice go out? When is the last day to ship the order to get to the customer on time? What day is the job scheduled to be produced and what machine will be running it? When should the screens be burned? When should the file be digitized for embroidery? What day is the art approval due back from the customer? Who owns the follow-up? Specifically what day should the art approval be sent to the customer? What is the last day the inventory can be received for the job? What day should purchasing buy the inventory? Who owns the entire job in its entirety and will be constantly monitoring everything on this list above this sentence? If you didn’t notice, everything was written backward from a planning perspective. Today the order was entered, but all of the triggers around the company should be automatically set based on your processes you have defined. Someone has to own the results. Meaning it’s their job. They are the Head Honcho of Results. Maybe even the Mayor of Get-it-done-town. How many times has a job not shipped on time from your shop because something on that list above “dropped through the cracks”? It happens. I’ve been there too. My hand is raised just like yours should be. So as an example, when the screen room or digitizing can’t do their job because the customer hasn’t approved file is someone on top of that situation? Who is responsible? What’s the process in your shop? For a lot of shops, this stumbles into a game of pointing nasty fingers at each other instead of stepping up and solving the problem. Do yourself a favor and stop this nonsense immediately. For starters, build a culture where people try to make the job easier for those downstream from them. This naturally will put a good chunk of the burden on sales and customer service, as they are the well-spring of the river. Usually, that starts with good information. Do you have a checklist that you employ in your shop for order entry? Are all the fields filled, spelling is correct, and numbers verified as accurate before you pass that order onto the next group? For the next month, try cataloging your mistakes and delays in your shop and about 80% of them will be due to some sort of information challenge. Quantities are ordered incorrectly because they bought 30 Mediums instead of 30 Smalls. The ink was labeled as PMS 268 instead of PMS 286. That handwritten 4 looked a lot like a 9. How many of these delays could have been prevented if someone had simply taken about two extra minutes and checked to make sure everything was exactly perfect before moving on? You need to be honest and identify these challenges when they pop up. Not from a “GOTCHA!” point of view, but from the perspective of identifying them and building a method of solving the problem by making it easy to do the right thing. Think about how to simplify it so the right thing is so painfully obvious it’s hard to screw it up. Accountability can grow when you build that mechanism. An avalanche doesn’t start with a tidal wave of snow. It starts small and rolls downhill gaining momentum with each foot traveled. 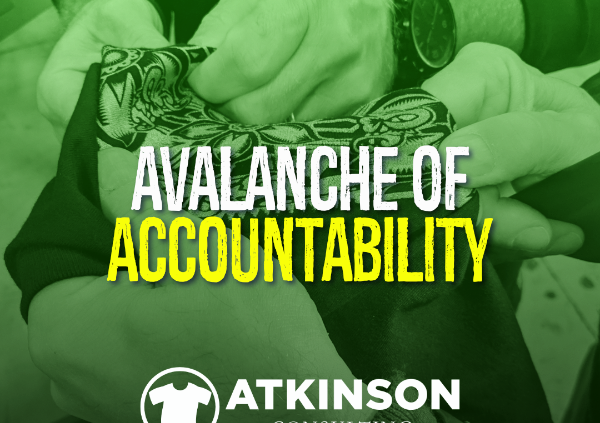 Accountability in your shop can grow the same way too. The first thing to do is to change one thing. If pilots use them before takeoff, and surgeons use them before operating, you can use them before hitting print after you enter an order in the system. They work great out on the production floor too. Checklists are great for identifying not only what should happen, but the order it should happen in. The new way isn’t suggesting that the old way is bad or wrong. That’s been your journey, and there’s nothing wrong with it. Congratulations, you made it this far! But now, we need better. Doing something different to ensure a superior outcome is going to take an open mind…and you guessed it, accountability. At one point in human history information traveled at the speed of a horse. There was nothing wrong with that, but things change. Your shop should evolve too. Quit riding that metaphorical horse. You don’t have to. A better solution is out there. To get faster? Better quality? More sales? Bigger profits? There is something behind your accountability problem. Can you narrow it down to a single idea or phrase? Ship three business days faster? Do things like you are supposed to? In order to push this out and make it tangible try to visualize the successful future with your accountability problem solved. What does that look like? A utopia of awesomeness with angels singing, right? Probably not, but much, much better than the status quo. Can you determine what you need to do to motivate or incentivize your staff to get there? Will you need to get some new equipment? Maybe some training? You might even need to revamp your business model or types of orders you are allowing to be taken. Nobody likes change. I know I don’t. But, I’m probably more open-minded than most. I like to hear all sides of the argument. Get the data. Talk to people. Some folks aren’t like that. They are on the other side of the stick on this. Change is scary. The present normal is safe, even if it isn’t quite working. 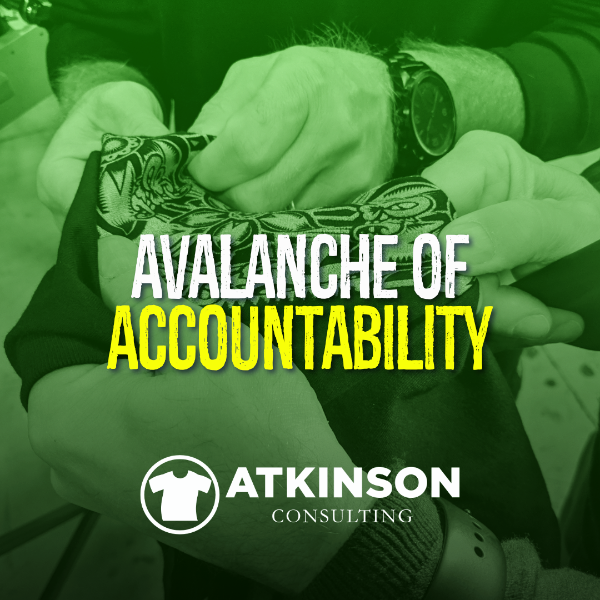 To get more accountability installed in your shop you need people to take ownership of what they do. This means understanding how the role they play pushes into the whole. One great phrase that my friend Mark Coudray taught me works really well in this instance when you are getting pushback on something. This gets them to articulate their worries and problems so you can help solve them. Some people don’t like to be held accountable for things because it may jeopardize their job. That’s what accountability is about. Owning the problem and making sure it doesn’t happen. It’s being responsible. These folks need to comprehend their role in the bigger picture. That they are part of a teamwork driven effort towards something. It doesn’t matter if everyone in the entire building had amazing craftsmanship on that order if it doesn’t ship on time. The customer only cares that it’s late. Get your team to see things through the eyes of the customer. They are the only ones that matter. When there is a problem, it isn’t the Screen Room’s fault or Purchasing’s. It’s the entire company. Victory and success happen the same way. When that customer comes back and places a repeat order, it’s a huge win. Get enough of those, and your sales growth percentage stats start to go beyond single digits. So remember, every order you take is an opportunity to succeed or fail. Each person that works for your company plays a role in determining which way it will go. Success is determined by what your customers think. Their vote is the only one that counts. All too often shop owners put off creating the first step in managing their employees, which is an Employee Handbook. It’s daunting. What do we need to include? I’ve taken that task and worked up and easy-to-use-template for creating an Employee Handbook. All you need to do is enter your shop information in the blanks, and you it’s ready to use. 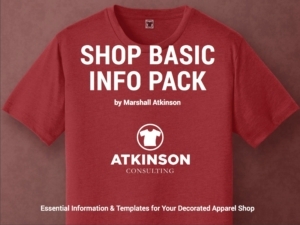 Included in the Shop Basic Info Pack eBook are also templates for writing a Business Plan, a section on Branding your shop, and my favorite…a Production Log Dashboard System. These are the basic tools you need to effectively run your shop. So whether you are a seasoned pro or someone just starting out, this eBook can save you a tremendous amount of time getting the basics going. Plus, it’s cheap at $49.